So you finished off Bosspider and instead of a nice upgrade as your reward all you got was another lousy Sigma stage. 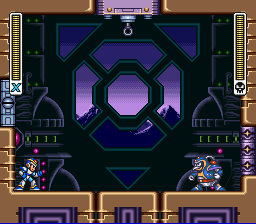 If you haven't noticed, the Sigma stages are meant to be the hardest by pitting you against a combination of the various challenges that you had encountered in separate stages. 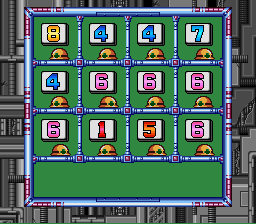 By the time you finish the game, you should have little trouble with any of them. Proceed to the right and maneuver yourself across the moving platforms. Head off to the right and blast the Battools and Hottarions. Jump on the moving platform and destroy any Battools that block your way, and proceed across the next two moving platforms. Head through the dungeon entrance to fight Chill Penguin. Use his weakness, Flame Wave. Chill Penguin: the easiest boss in the game, made even easier with his weakness, Flame Wave. Hide in the corners and wait until he slides or presses the lever on the ceiling, then blast him with Flame Wave. Chill Penguin will then be knocked back and stunned. After you hit him once, head back to one of the corners and repeat. 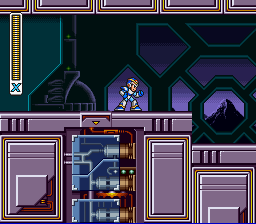 You should be able to get past this area easily with the Mech Armor. Destroy the soldier before he can jump into the nearby Mech Armor, then take it for a ride. 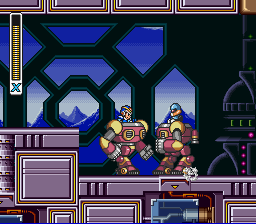 Proceed through the next area on the Mech Armor, as it should present no problem. When you get to the end, climb up the ladder. There are two paths here: the one on the left contains many cannons on propellers while the right passage has several Turn Cannons. You can bypass either area easily with the Chameleon Sting's alternate fire, or you can go through it normally (make sure you destroy the cannons on the left if you go right to avoid getting hit). When you get to the top, go through the dungeon door. Kill him quickly with Chameleon Sting. Yet another easy boss. Just shoot him with Chameleon Sting and he'll be gone in no time. The next area is full of Spinies, Battools, and Hoganmers. 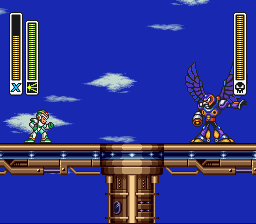 Just like Sigma Stage 1, use the Chameleon Sting's alternate fire to easily get past them. Once you do, step through the final dungeon to fight Rangda Bangda. A giant face, Rangda Bangda is an end boss type that has been around since the original Mega Man games. As you enter the room you'll notice that it looks normal, having two eyes and a nose. This face, however, is made up of four parts: three orbs or eyes and a nose. By destroying one part you'll take Rangda Bangda's health down considerably. The only way to destroy it completely is to defeat every part. The orbs are more easily destroyed than the nose. The blue orb tracks your position and attempts to collide with you, however it moves from point A to point B with pauses in between. The green orb will appear in one of the eye sockets and fire projectiles at you. Most difficult of all is the red orb, which is a combination of both the blue and the green: it attempts to ram you while firing too, but it now fires three projectiles instead of one. More simple than the orbs, the nose will transform into a mobile, small robot that bounces around the walls. The trick though is that when it becomes active the two walls will close into the middle area, disabling you from walking on the ground. Stick to the walls if you wish to survive. The nose will choose a different path each time, however it's fairly simple. It's first movement is always diagonally upwards, however the side that it chooses is random. After that it's up to you to estimate where it will bounce and where you can safely hide and fire at it. Oh, you forgot that you had to kill it? Make sure you utilize every moment for a good shot. You can use your homing torpedoes or rolling shield or shotgun ice to avoid really needing to aim. When the walls close in and the nose detaches, you'll be able to shoot it with either the Chameleon Sting or a fully charged Homing Torpedo (Homing Torpedo will deal the most damage)! Once the eye opens, shoot it! The blue and red eyes can also come towards you, so watch out. Rangda Bangda's open green eye. Rangda Bangda's open red eye. This page was last edited on 19 October 2017, at 16:18. This page has been accessed 102,836 times.